Unquestionably, Wireless USB is a technology with great potential. 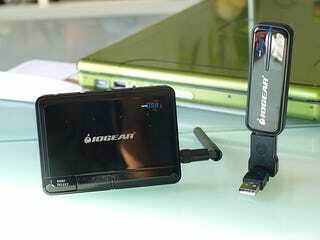 With the introduction of IOGear's Wireless USB Hub, they claim it connects to your PC easily, clears up wire clutter and makes speedy file transfers. But after playing with IOGear's Wireless USB Hub, we can't say this device lives up to that potential. Connecting can bothersome, USB 2.0 is substantially faster and the wires are still there. In theory, using the Wireless USB Hub is supposed to be as easy as connecting the antenna dongle to your PC, plugging in your hub, and hooking up USB devices. In reality, the hardware requires installing separate drivers for the hub and dongle, associating the hub to your PC via an authentication process and using its custom software to connect the hub. Yet the hub still had trouble maintaining a strong signal despite sitting a foot away from the antenna dongle. In transferring files, we had issues trying to get a 500 MB file from an external hard drive to the PC. In the one attempt we were successful, it took 2min, 45sec to transfer the file. Compared to the 22 seconds it took using USB 2.0, Wireless USB isn't in the same league. Even smaller files took longer to transfer as a 100 MB folder of MP3's took roughly 45 seconds, whereas USB 2.0 completed the transfer in under 10. But most interesting of all, is when you get to the bottom of this thing, it isn't all that wireless. Sure, there's a wireless connection between the dongle and the hub, but wires still exist between your USB devices and the hub and two extra pieces of hardware (plus another AC adapter) are added into the mix. So really, whats the point? If you want to use a laptop in various parts of the house, but still want the freedom of being connected to a hard drive or printer (and for whatever reason don't want to use a wireless network), this hub may be for you. But for anyone else with a desktop or who is OK with using their peripherals in a single room, the $200 price tag of this wireless USB hub just isn't worth it. When USB gadgets and computers start talking to each other directly, I'll start paying attention to wireless USB.